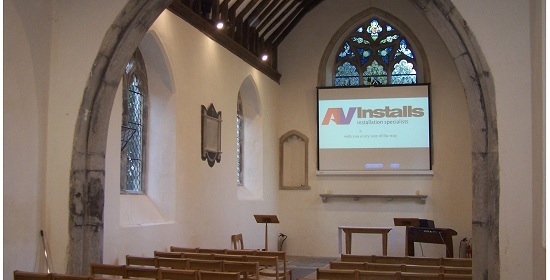 AV Installs Ltd specialise in providing audio visual installation services for churches and places of worship, always at the fore front of our minds is the love that members of the church and congregation have for their buildings of worship. 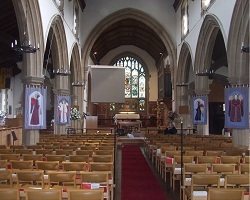 Audio Visual systems in churches have developed significantly in recent years with the introduction of big screen multimedia projection systems and flat screens used to display messages and hymn words. 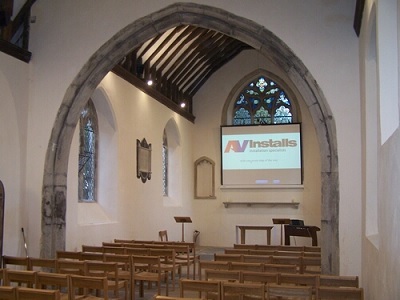 We are the experts at integrating AV Systems In Churches, our services and installation methods are customised to be sympathetic to the character of your place of worship. After an initial survey our expert AV engineers will design the most user friendly appropriate solution taking into account all your needs whilst having the minimum impact on aesthetics. We provide a complete professional service including a comprehensive range of professional audio visual equipment along with expert advice on all the latest products and how they could benefit your project. When it comes to commissioning a large venue projector in a Church there are many things to take into consideration, lighting conditions and possible mounting solutions often dictate what is reasonably practical. In some cases a Long Throw Projector is the only available option and allows us to install projectors at much greater distances from the screen. Then there is the question of what connections you you will require and where best to put them. It is not uncommon for cable distances to become to long for standard cabling and AV over CAT5 signal converters may be required. Another massive consideration is which type of screen is best and what size would be most suitable to best serve the congregation whilst not becoming over bearing. When it comes to professional AV in Churches there is no set formula every installation and solution is tailor made reflecting your technical requirements alongside the needs of the congregation. If you would like to speak to us about your project or arrange for one of our engineers to provide a full assessment needs then please don't hesitate to get in touch via our contact page. 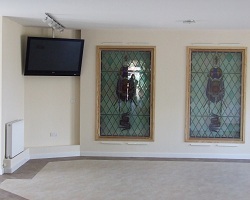 ..Church Projectors...PA Systems..Display Screens..Hearing Loops..Audio Visual for Church..